The Carro Veloce CV-33 or L3/33 was a tankette originally built in 1933 and used by the Italian Army before and during World War II. Many CV-33s were retrofitted to meet the specifications of the CV-35 in 1935. In 1938, the CV-33 was renamed the "L3/33" while the retrofitted CV-35s became known as "L3/35s." The original CV-33 carried a two-man crew protected by 12 mm of welded armor and was armed with a single 6.5 mm machine gun. The L3/33 saw action in China, Spain, France, the Balkans, North Africa, Italian East Africa, Italy, and Russia. Like most of Italian equipment, it was designed to be used in a colonial situation where they did not have much in the way of opposition. During the North African battles of early WWII, they proved to have little worth. Where they were still useful was in occupation duty in hilly and mountainous terrain where standard tanks could not operate. When one opens the box, it almost looks as if there are two kits included. However, that is due to two large sprues from what I guess is the late version from which one only uses a few bits. Typical of Bronco kits, the molding is first rate. There are a ton of parts, thanks to Bronco's commitment to providing the most detailed kit they can. This means that you don't get just a curbside kit but one that has complete engine and interior detailing. The interior contains positions for both the driver and the tank commander as well as controls for both. There is a complete transmission and drive train to fit inside. Also included for the back of the chassis is the four cylinder engine along with all its accessories and exhaust. This includes the rather unique semi-circular radiator system, which must have made the interior of this vehicle quite uncomfortable after a while. I should mention the photo etch fret which is nicely done and not very complex, something many modelers will appreciate. One basically builds all this on the floor pan and then attaches the rest of the tankette around it. On the upper section, the engine access hatches can be posed open or closed. This is true of the driver and commander's hatches as well. The suspension bits are nicely done and designed to turn, which will help with the installation of the tracks. 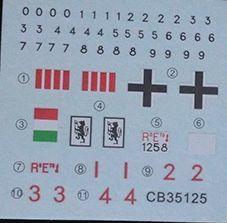 In this kit they are link and length, which is a nice combination for realism. The small turret (so to speak) that holds the twin machine guns is also nicely done and can move in elevation. The view windows,both front and rear, for the driver and commander when the vehicle is buttoned up can also be displayed open or closed. 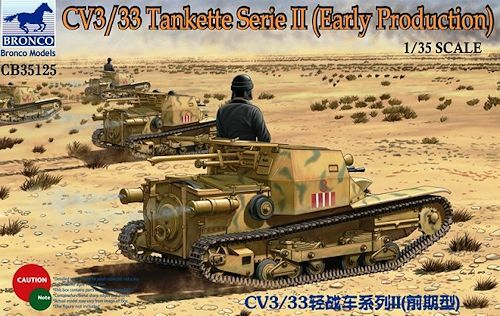 It is nice to see a kit of this important Italian Tankette being produced. 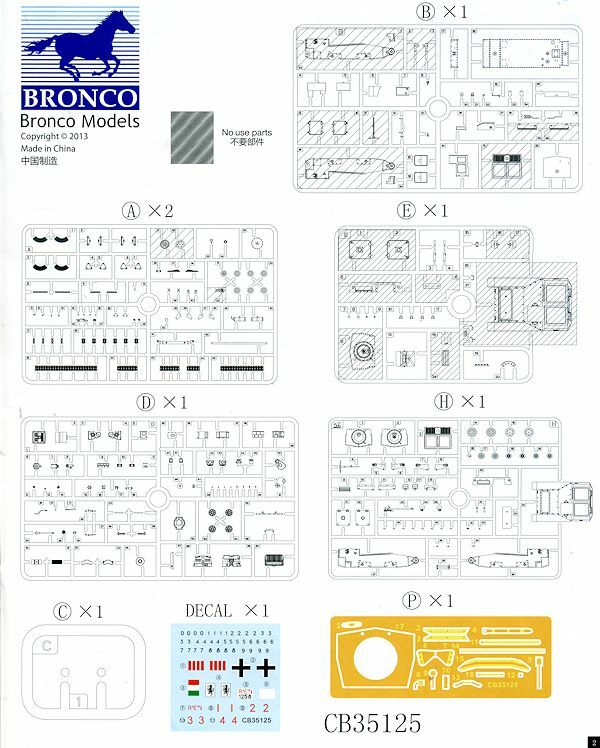 It is not a large vehicle, but Bronco has produced one with a great deal of detail in it so this will not be a quick build. It's a vehicle that those who like Italian subjects will want in their collection.